Manchester United‘s summer transfer window was anything but fruitful. All they could manage was to sign three players – a third-choice goalkeeper, a full-back for the future, and Brazil international Fred in midfield. The fact that no marquee signings were made is a worrying fact for United fans who were made to expect so much from Jose Mourinho, as the Portuguese had made it clear that he wanted to bolster his back-line before the new season began. Nonetheless, they need to move on, and focus on their opener against Leicester City in the Premier League. And though the transfer window may have finished, fresh news from a chaotic deadline day just isn’t letting up. GFFN are reporting that in the dying hours of deadline day, Manchester United enquired about two Paris Saint-Germain players, with an aim to sign at least one player before the end of the window. 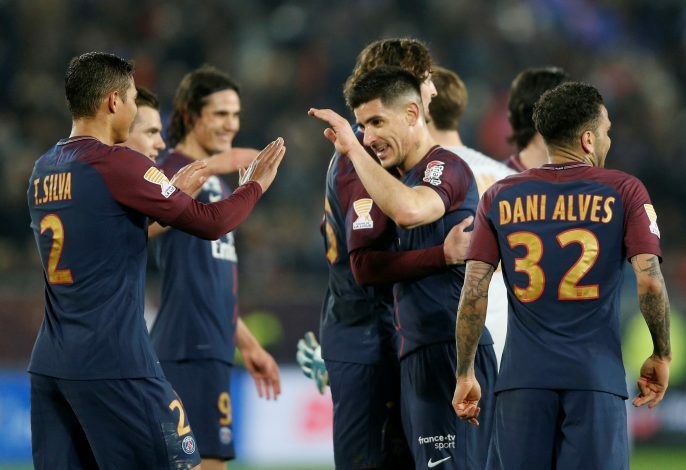 The report names Adrien Rabiot and Layvin Kurzawa, as the duo that United were finding out about, only to have their hopes dashed yet again, just as they did with Diego Godin at Atletico Madrid. Rabiot, who plays as a deep-lying midfielder but can get forward too, rejected United to stay in Paris, to play under new boss Thomas Tuchel. The Reds’ interest in the pair is interesting because they don’t exactly come across as the kind of players Manchester United would be after for a long time, and one would expect some bigger personalities to be in the running. This, in many ways, sums up the sheer desperation that the English giants had to give their fans something to look forward to as the new season begins. But as things stand, the Mancunians will have to wait till at least January comes around to try their luck in the market again.